The soft and detailed illustrations beautifully capture the perfection of both the natural setting, and of the sweetness of the animals of the woods. I love the details like the birch twig flag pole and the little white tea lights that are draped over Argyle's real tree canopy bed. The curiosity and personality of the animals in the backgrounds, like the beavers surprised eyeballs watching the newspaper folded hat Wooosh away in the wind, to the white tip bushy tail fox checking out his mailbox, display feelings in their expressions during each small moment. A cute story of perseverance and patience when you have to change a plan. The narrative serves for a model for picking yourself up and dusting yourself off through the small tangles. Sometimes you cannot control a situation, and if you can unravel what you can control, you might just find, the best situation for that moment after all. 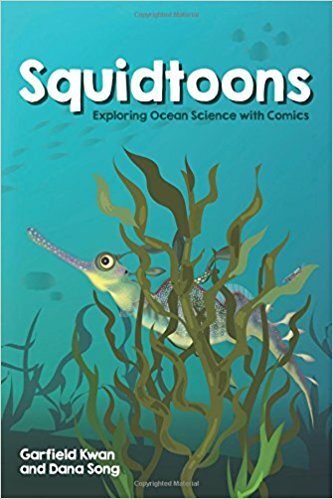 If the cover and title of Squidtoons doesn't demand attention, the idea of exploring and learning about ocean science with comics should. What a clever way to merge science, reading, and engagement- leading to new learning and the deepening of ocean knowledge. 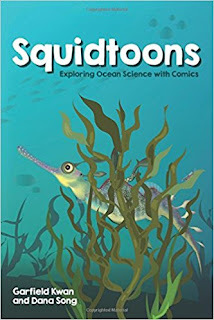 From the fluent funny and informative text and illustrations, to the talking bubbles discourse between three species of seadragons, to the pages with comics in panels, this book offers a lot to admire. The pages are filled with fictional action snapshots that reveal interesting facts about ocean life and the creatures that inhabit it. 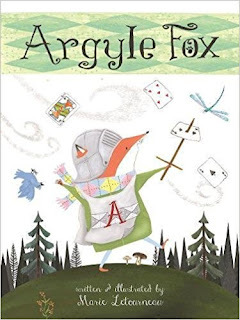 This book has a wide age appeal and is the ultimate example of the possibilities of a STREAM (Science, Technology, Reading, Engineering, Arts, Math) mindset towards teaching. This belongs as a mentor text in science classrooms, grade kindergarten through high school. In kindergarten writers learn about talking bubbles. After learning about a seadragon or a horseshoe crab, I could see writers drawing the animal and adding words to a talking bubble. Comics and graphic novels are fantastic portals to new schema, enhancing the readers abilities as a writer, and deepening their reading comprehension strategies between every page and panel, and effective non fiction access feature (table of contents, bold words, diagrams, labels). This will appeal to many of learners, and I highly recommend it for classroom and library shelves.